David B. Hoyt, MD, FACS, and Clifford Y. Ko, MD, MS, MSHS, FACS, Editors. 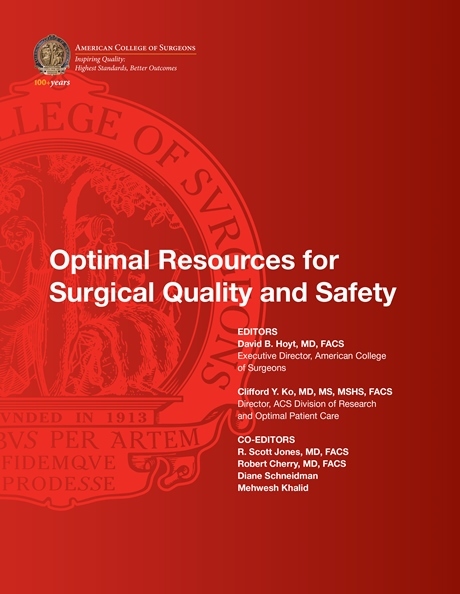 Optimal Resources for Surgical Quality and Safety is intended to be a trusted resource for surgical leaders seeking to improve patient care in their institutions, departments, and practices. It builds on the the College’s long tradition of developing successful quality programs for improving surgical care, and introduces key concepts in quality, safety, and reliability and explores the essential elements that all hospitals should have in place to ensure patient-centered care.